This is a prospective histomorphological assessment of dermal innervation in biopsies taken before and after multidrug therapy (MDT) f rom 41 leprosy patients: 35 borderline tuberculoid (BT), 3 borderline lepromatous (BL), 3 lepromatous (LL). Biopsies of the same lesions taken before commencement (diagnostic therapy) and at the end of therapy (check biopsy) were compared. Hematoxylin and eosin, immunoperoxidase stain for S-100 protein, and the Holmes' silver impregnation method for nerve cells and fibers were used. Skin biopsies were classified as having detectable or undetectable nerves. Of 35 patients with BT leprosy, 17 had no detectable nerves in their diagnostic biopsies; in the check biopsies of 13 of these 17, dermal nerves remained undetectable, in 2 they were S-100 positive but were Holmes negative. Identifiable dermal nerves were present in diagnostic biopsies f rom 18 patients; in the check biopsies 5 of these 18 had no detectable nerves while in the remaining 13 nerve branches could be detected. The study provides histological documentation of complete damage to dermal innervation in 62.85% (22/35) of patients with BT leprosy, of which 14.28% (5/35) occurred during MDT. Of the patients with detectable dermal innervation at the onset of MDT, 27.7% (5/18) suffered continuing damage during MDT. Cette étude histomorphométrique prospective a pour but d'évaluer l'innervation dermique de biopsies prélevées avant et après la polychimiothérapie (PCT) chez 41 patients hanséniens: 35 tuberculoïdes borderlines (BT), 3 lépromateux borderlines (BL), 3 lépro- mateux. Les biopsies des mêmes lésions prises avant le début (biopsie diagnostique) at à la fin du traitement (biopsi de contrôle) furent comparées. Les colorations a l'hematoxylin et éosine, l'immunopéroxidase spécifique de la protéine S-100 et l'imprégnation argentique de Holmes furent utilisées pour évaluer les cellules nerveuses et les fibres. Les biopsies cutanées furent classées selon la présence ou l'absence de nerfs. Parmi 35 personnes souffrant de lèpre BT, aucun nerf n'était détectable au sein des biopsies diagnostiques chez 17 patients. Au sein de ces 17 patients sans nerf detectable au moment du diagnostique, les nerfs dermiques restèrent non détectables chez 13 patients lors de l'examen de la biopsie de contrôle. Chez deux patients, ces nerfs ne furent détectés qu'à l'immuno- histochimie pour la protéine S-100 et restèrent négatifs pour l'imprégnation argentique de Holmes. Des nerfs dermiques furent identifiés a l'examen des biopsies diagnostiques chez 18 patients. Cinq de ces 18 patients n'avaient plus de nerf détectable à l'examen de la biopsie de contrôle tandis que des rameaux nerveux pouvaient encore être détectés parmi les 13 patients restants. Cette étude apport l'illustration histopathologique de la destruction complète de l'innervation dermique chez 62.85% (22/35) des patients souffraut de lèpre BT, 14.28% (5/35) ayant eu cette destruction durant la PCT. Parmi les patients ayant une innervation dermique détectable à la mise an oeuvre de la PCT, 27.7% (5/18) ont souffert de lésions progressives durant la PCT. Este es un estúdio histomorfológico prospectivo de la inervaeión dérmiea en biópsias de 41 pacientes con lepra tomadas antes y despue's del tratamiento con poliquimioterapia (PQT). Las biópsias correspondieron a 35 casos de lepra tuberculoide subpolar (BT), 3 de lepra lepromatosa subpolar (BL) y 3 de lepra lepromatosa (LL). Se compararon las biópsias de las mismas lesiones tomadas antes (biópsias de diagnóstico) y después (biópsias de chequeo) dei tratamiento. Las biópsias se tineron con hematoxilina y eosina, inmunoperoxidase para la proteína S-100. e impregnation argéntica de Holmes para células y fibras nerviosas. Las biópsias se clasificaron como "con nervios détectables" o como "sin nervios détectables." De los 35 pacientes con lepra BT, 17 no tuvieron nervios détectables en sus biópsias de diagnóstico; en las biópsias de chequeo 13 de estas 17 permanecieron sin nervios détectables. Dos biópsias fueron S-100 positivas pero Holmes negativas. Los nervios dérmicos estuvieron presentes en las biópsias de diagnóstico de 18 pacientes; en las biópsias de chequeo, 5 de éstas 18 biópsias no tuvieron nervios détectables, aunque estos si se observaron en las 13 biópsias restantes. El estudio proporciona documentación histológica de daño completo a la inervaeión dérmica en 62.85% (22/35) de los paciente con lepra BT. En el 14.28% (5/35) de los pacientes, el dano ocurrió durante la PQT. De los pacientes con inervaeión dérmica detectable al inicio de la PQT, 27.7% (5/18) sufrieron daiïo continuo durante el tratamiento. Nerve damage and sensory impairment are central to the pathogenesis and clinical manifestations of leprosy. Nerve damage can occur before diagnosis, during multidrug therapy (MDT) or even after completion of therapy (l5). Studies documenting nerve damage occurring during the course of treatment are few (9, l5) and based on clinical observation, mainly sensory nerve testing. The response of tissue to interneural invasion by Mycobacterium leprae varies greatly-from minimal destruction, with a few intraneural acid-fast bacilli (AFB) in Schwann cells with no functional change, to extensive granulomatous infiltration of the entire nerve with resultant structural destruction and functional loss (5). Cutaneous nerves being the main targets of infection (2, 7), the sensory loss is primarily intracutaneous and invariably present at the time the patient is first seen (l3). The cutaneous innervation ascends along with the dermal blood supply from the underlying subcutaneous tissue and forms analogous superficial and deep plexuses. The deep nervous plexus is located at the dermal subcutaneous junction and is composed of multiple nerve branches (l4). Microscopically, the greatest changes occur within cutaneous and subcutaneous nerves in the region of the skin lesions (11). The evaluation of nerve damage by clinical sensory testing is known to be highly variable (8). At the clinic run by our institution it is routine practice to biopsy a representative skin lesion in all patients of leprosy to document the diagnosis prior to initiation of MDT. Several dermatologists also take a biopsy on completion of MDT. Accordingly, this study was undertaken to evaluate dermal innervation in skin biopsies before and at the end of treatment. This is a prospective study of 41 clinically, histopathologically and bacteriologically diagnosed patients with leprosy. The patients were classified by the Ridley- Jopling scale using standard criteria (10). For purposes of treatment the World Health Organization (WHO) classification was followed (16). Pre-treatment (diagnostic biopsy) and post-treatment (check biopsy, taken following completion of MDT) were available for all patients. A check biopsy was obtained from the same lesion as the diagnostic biopsy. Only those patients whose biopsies included adequate subcutaneous tissue were included so that both superficial and deep nerve plexuses could be studied. Routinely processed, formalin- fixed tissue was embedded in paraffin and cut at 5 Multiple semi-seriated sections were stained with hematoxylin and eosin (H&E) and an immunohistochemical method (1) for S-100 protein using a commercially available (Universal labeled streptavidin biotin, DAKO) kit. The diagnostic biopsies were classified into two groups based on the presence or absence of detectable dermal nerves in S- 100-stained sections. Check biopsies were similarly assessed. 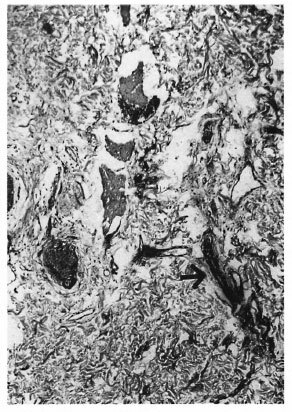 In all patients with detectable dermal nerves the Holmes' (3) stain was used to demonstrate the presence or absence of axons. There were a total of 41 patients with leprosy, 35 with borderline tuberculoid (BT), 3 with borderline lepromatous (BL) and 3 with polar lepromatous (LL) from whom both diagnostic and check biopsies were available. Six patients (the three with BL and three with LL leprosy) had detectable nerves in their diagnostic as well as check biopsies. Overt reactional states were not seen in any of the patients in this study. There were 35 patients with BT leprosy (The Table). The group with no detectable nerves (S-100 negative) in the diagnostic- biopsy consisted of 17 patients; in 15 dermal nerves were not detectable in the check biopsy and in 2 S-100-positive filaments could be detected but no axons were seen with Holmes' stain (Holmes' negative). The group with detectable nerves (S-100 positive) in the diagnostic biopsy (Fig. 1) consisted of 18 patients; 3 of whom had no demonstrable axons. In the check biopsies 13 patients had detectable nerves with axons (Holmes' positive) (Fig. 2). In five check biopsies dermal innervation was not detectable; three of these were the same patients in whose diagnostic biopsies axons could not be identified. Fig. 1. Borderline tuberculoid leprosy before treatment: detectable dermal nerve branch (arrow) (immunoperoxidase for S- 100protein xl00). Fig. 2. Borderline tuberculoid leprosy after treatment: axon (arrow) in dermal nerve branch (Holmes' stain x 1000). A skin biopsy is performed to document the diagnosis of leprosy; however, evaluation of nerves in a skin biopsy is not always undertaken. The obvious priority in histopathological examination of skin biopsies is the documentation of the diagnosis based on the demonstration of granulomatous infiltrate or M. leprae. Small nerve branches are difficult to recognize in H&E-stained sections, especially when there is appreciable inflammation (17). Staining for S-100 protein allows easy identification even of small nerve twigs, both in the superficial and deep plexuses, and their remnants in granulomas as positively staining, fibrillary structures (4, 6, 12). In BL and LL leprosy the large numbers of M. leprae, staining positively with the S-100 stain, may interfere with the search for nerve branches. However, lepra cells are clearly different from the fibrillary structure of nerve branches. Similarly, the granular cytoplasmic positivity of Langhans' cells is sufficient to distinguish them from nerve branches. The S-100 stain is thus a valuable tool for the evaluation of dermal innervation in skin biopsies. In this study, a group of 17 patients had initially undetectable dermal nerves; in 15 the absence persisted even after completion of therapy. In the check biopsies of the remaining two patients, it may be significant that only Schwann cells (S-100 positive) were seen while no axons could be demonstrated (Holmes' stain negative). The inability to demonstrate dermal innervation in the diagnostic as well as the check biopsy in this group suggests established damage that is refractory to treatment. In a majority (13/18) of the patients with detectable dermal nerves in the diagnostic biopsy, dermal nerve branches (S-100 and Holmes' stain positive) could be detected in the check biopsy as well. In the remaining five patients, the S-100 stain was positive in the diagnostic biopsy but in three, no axons could be demonstrated. In the check biopsy, all of these patients were S-100 as well as Holmes' negative. Axonal loss in the diagnostic biopsy may be an indicator of continuing nerve damage which will not be arrested by treatment. This study supports the concept that axonal preservation is central to neuronal recovery from injury. The demonstration of axons in a diagnostic biopsy may, therefore, be an indicator of a favorable outcome. The poor histological outcome in two patients with demonstrable nerves with axons in their diagnostic biopsies indicates continued destruction which might have occurred as a result of subclinical or silent reactional episodes in response to persistent antigenic stimulus during treatment, healing with fibrosis. The six patients with BL and LL leprosy had demonstrable nerves (S-100 and Holmes' positive) in both the diagnostic and the check biopsies. This is in agreement with the view of Job (5) that despite unrestricted multiplication of bacilli in Schwann cells, perineural cells and macrophages in and around nerves, damage occurs only slowly, if at all, as long as there is no swelling of the nerve, increase in intraneural pressure or trauma. In conclusion, nerve damage in leprosy continues to occur during the course of therapy in a small number of patients. Histopathological examination, when available, could be a valuable tool in the assessment of nerve damage in leprosy. The S-100 and Holmes' stains provide additional useful information not available by examination of H&E-stained slides alone. Established damage demonstrated at initiation of MDT remains unchanged. Axonal loss appears to be the central event in nerve damage. Acknowledgment. The materials for this paper form part of the thesis submitted by Dr. Mona Jain for the M.D. degree in Pathology at Delhi University, Delhi, India. The authors wish to thank Dr. S. K. Shankar, Additional Professor of Neuropathology, National Institute of Mental Health and Neurosciences, Bangalore, for his valuable suggestions on methodology in the early part of this study; Dr. M. Ramam, Associate Professor of Dermatology, All India Institute of Medical Sciences, New Delhi, and Dr. S. N. Bhattacharya, Associate Professor of Dermatology, University College of Medical Sciences, Delhi, for their help with the manuscript. 1. Boenisch, T. Staining methods. In: Immunohisto- cliemical Staining Methods Handbook. Naish, S. J., Boenisch, T., Farmilo, A. J. and Stead, R. H., eds. Santa Barbara, California: DAKO Corporation, 1989, pp. 13-18. 2. Dastur, D. K. Cutaneous nerves in leprosy; the relationship between histopathology and cutaneous sensibility. Brain 78 (1955) 615-633. 3. Downing, E. A. Neuropathology histotechnology-Holmes' method for nerve cells and fibers. In: Armed Forces Institute of Pathology Manual of Laboratory Methods in Histotechnology. Prophet, E. B., Mills, B., Arrington, J. B. and Sobin, L. H., eds. Washington, D.C.: American Registry of Pathology, 1992, pp. 92-93. 4. Fleury, R. N. and Bacchi, C. E. S-100 protein and immunoperoxidase technique as an aid in the histopathologic diagnosis of leprosy. Int. J. Lepr. 55(1987) 338-344. 5. Job, C. K. Nerve damage in leprosy. Int. J. Lepr. 57(1989) 532-539. 6. Kahn, H. J., Marks, A., Thom, H. and Baumai, R. Role of antibodies to S-100 protein in diagnostic pathology. Am. J. Clin. Pathol. 79 (1983) 341-347. 7. Khanolkak, V. R. Study in the histology of early lesions of leprosy. Lepr. India 24 (1952) 62-77. 8. Lienhardt, C., Currie, H. and Whef.ler, J. G. Interobserver variability in the assessment of nerve function in leprosy patients in Ethiopia. Int. J. Lepr. 63(1995)62-76. 9. Richardus, J. H., Finlay, K. M., Croft, R. P. and Smith, W. C. S. Nerve function impairment in leprosy at diagnosis and at completion of MDT: a retrospective cohort study of 786 patients in Bangladesh. Lepr. Rev. 67 (1996) 297-305. 10. Ridley, D. S. and Jopling, W. H. Classification of leprosy according to immunity; a five-group system. Int. J. Lepr. 34 (1966) 255-273. 11. Sabin, T. D., Swift, T. R. and Jacobson, R. R. Leprosy. In: Peripheral Neuropathy. 3rd edn. Dyck, P. J., Thomas, P. K., Griffin, J. W., Low, P. A. and Poduslo, J. F., eds. Philadelphia: W. B. Saunders Co., 1993, pp. 1354-1379. 12. Singh, N., Arora, V. K., Ramam, M., Tickoo, S. K. and Bhatia, A. An evaluation of the S-100 stain in the histological diagnosis of tuberculoid leprosy and other granulomatous dermatoses. Int. J. Lepr. 62(1994) 263-267. 13. Srinivasan, H. Prevention of disabilities in patients with leprosy: a practical guide. Geneva: World Health Organization, 1993. 14. Stenn, K. S., Goldenhersh, M. A. and Trepeta, R. W. Structure and function of the skin. In: Systemic Pathology. 3rd edn. Weedon. D., ed. Sym- mers, W. St. C., general ed. Edinburgh: Churchill Livingstone, 1992, pp. 1-14. 15. van Brakel, W. H. and Khawas, I. B. Nerve damage in leprosy: an epidemiological and clinical study of 396 patients in West Nepal-Part I. Definitions, methods and frequencies. Lepr. Rev. 65(1994)204-221. 16. WHO Study Group. Chemotherapy of leprosy for control programmes. Geneva: World Health Organization, 1982. Tech. Rep. Ser. 675. 17. Wiersema, J. P. and Bineord, C. H. The identification of leprosy among epithelioid cell granulomas of the skin. Int. J. Lepr. 40 (1972) 10-32. M.D., Department of Pathology, University College of Medical Sciences and GTB Hospital,Delhi 110 095, India. Reprint requests to Dr. Bhatia. Received for publication on 21 December 1999. Accepted for publication in revised form on 11 May 2000.